Solanas was our favourite beach, and we also decided to stay in the area (). It is the closest to Punta Del Este airport as well. Both the neighboorhood and beach is quieter and more relaxing than the others. It waters are clams and the sand is humid. It is large with plenty of space for sports and umbrellas, making it ideal for families as well. The views are stunning as well, with Punta Ballena and Cerro Pan de Azucar as its highlights. And probably the most important of its characteristics is that they have the best sunsets, as you can see in the picture above. It now seems to be trendy to spend the day on another beach, such as La Brava, and then go to Portezuela o Solanas for the sunset. 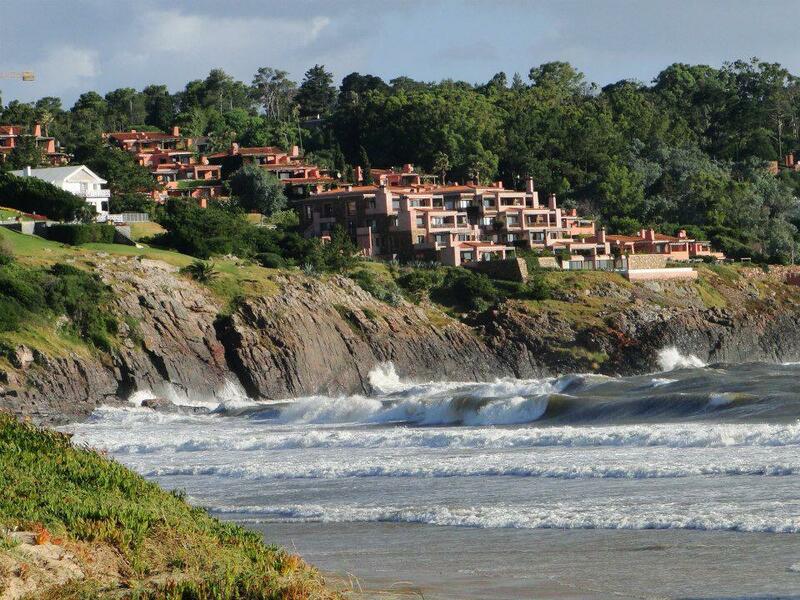 On one side of Solanas, you have Portezuelo, a picturesque beach club with beautiful houses facing the sea on the hills. On the other side, you can find Chihuahua, the nudist beach of Punta. The three of them are next to each and you can walk within them, but there is a long distance. Las Grutas is next to Punta Ballena cliff. 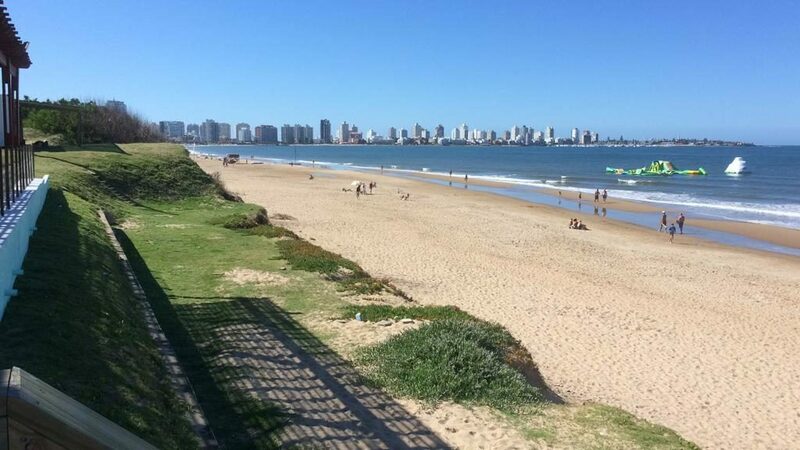 So a day on this beach is also a great opportunity to visit one of the best viewpoints in Punta del Este. You can see the sea on both sides along the road, which ends in a roundabout where you can park, and where you can also find shops selling traditional souvenirs. The town’s best-known point of interest is also nearby, the Casapueblo citadel. It was Sculptor Carlos Páez Vilaró’s onetime residence and atelier. Páez Vilaró began his “living sculpture” in 1958, sometimes adding a new room to host a particular friend, and eventually created a lodge within Casapueblo [Wikipedia]. It is now Uruguay’s most eccentric hotel and one of the most popular attractions in the country. In regards to the beach itself, it is large and sandy. And besides its waves and not-always calm waters, you can go to edge to visit its famous caves. There are plenty of cliffs, rocks and fishing spots. The surrounding promontories are also popular hang gliding spots. This site is really a natural grotto formed in the rock. 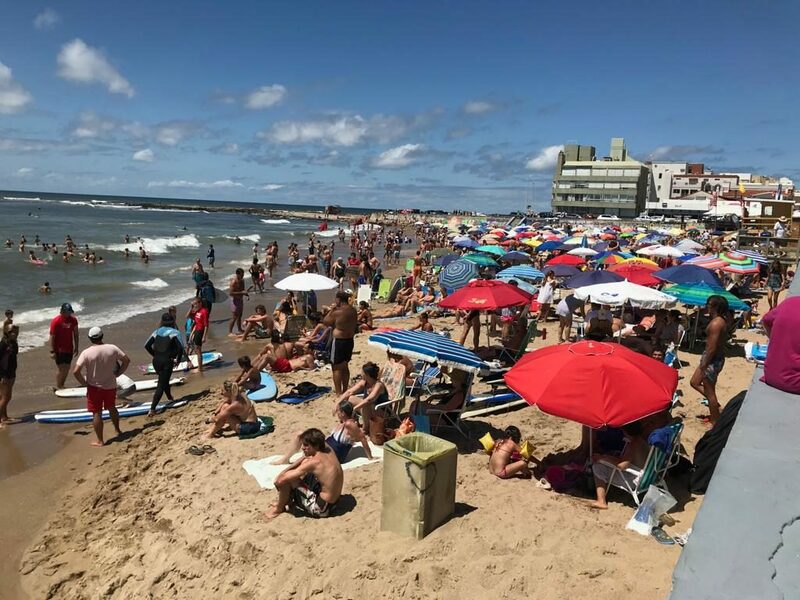 And not far from the beach you will find places to park for free, restaurants serving chivito (Uruguay’s popular sandwich, combining meat, potatoes, cheese, mayonnaise and fried eggs). 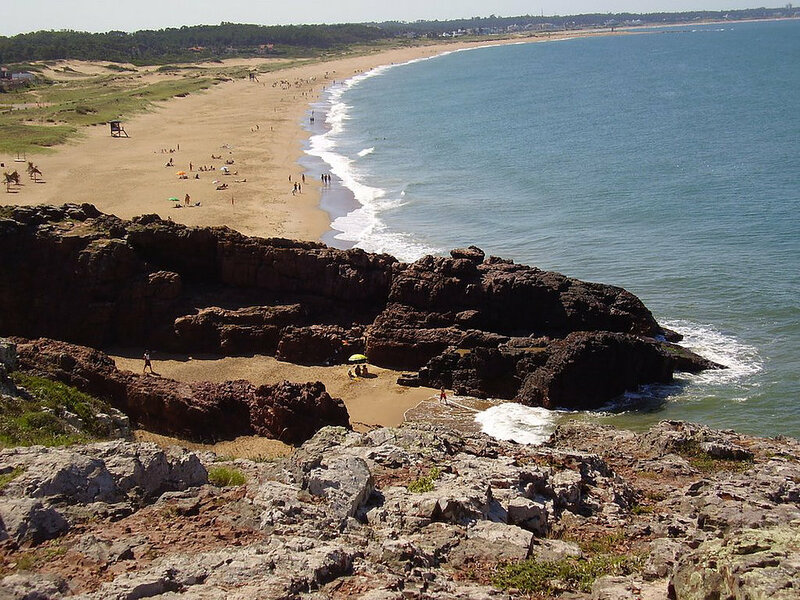 For more information about this beach and its surroundings visit this website (only available in Spanish). 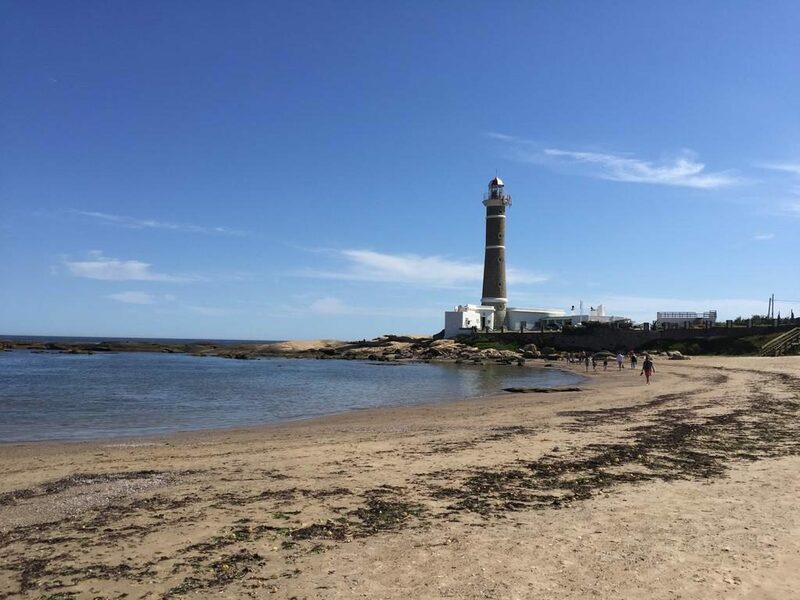 The town of José Ignacio was originally a fishing village that later became a kind of celebrity resort. Many posh and rich people from Argentina, Uruguay and Brazil have summer houses around the area. It is common to find artists, politicians and curious people looking for them. 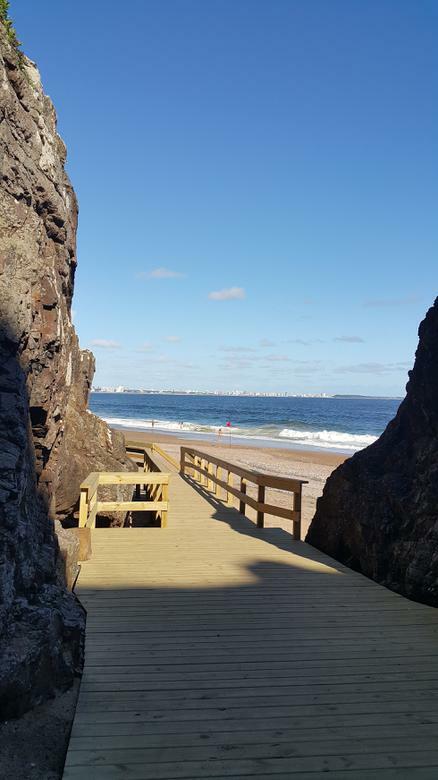 José Ignacio has quiet and peaceful beaches on one side and some with strong waves and current on the other side, the same contrast you can find all over Punta del Este. At the top of the peninsula, there is a 32.5m high lighthouse that was built in 1877, which is its main landmark. 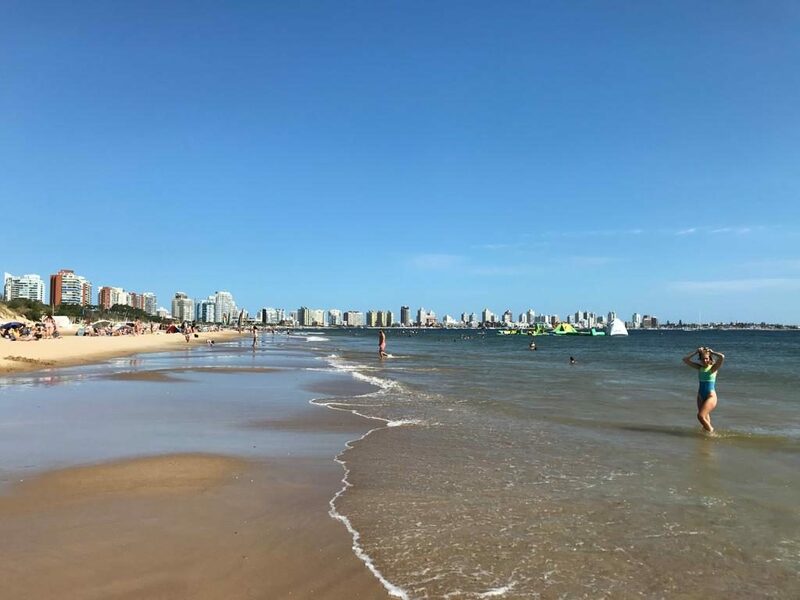 It is about 38 km from the main city and all the way you border the coast, passing by man beaches and other good areas as la Barra, another vibrant area with a lot of restaurants and bars. José Ignacio is a great place for fishing and the gastronomy of the place is rich, offering dishes based on fish and seafood. One of the most famous places is Parador La Huella. With a cool, hippie-chic vibe and good food. Shrimp risotto, grilled octopus, BBQ fish, mussels, and more. You will need to book in advance. Continuing along a seaside road after Las Grutas, and heading to the city centre, you will find La Mansa. It comprises a wide area of sandy beaches and beach clubs (“paradores”), which are marked with names and numbers (1 to 36). 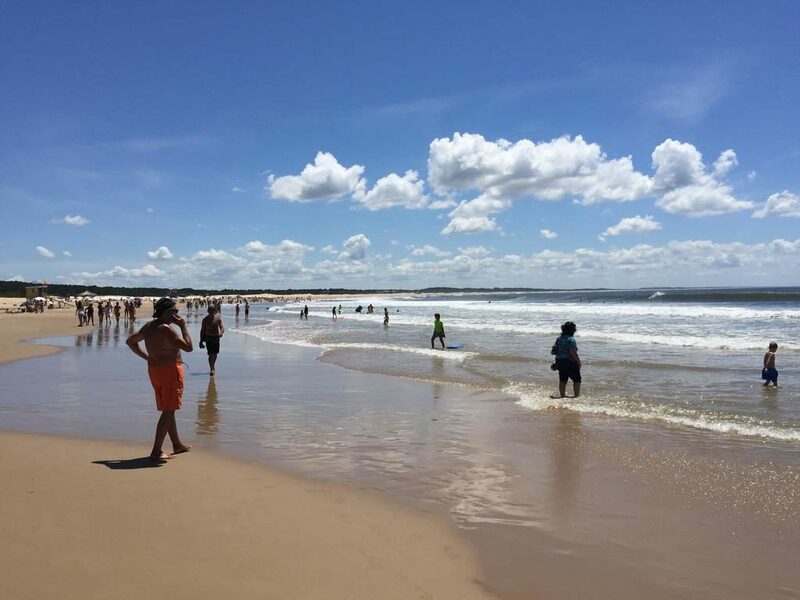 La Mansa is one of the two most popular and characteristic beaches in Punta del Este. Mansa means calm, and that’s how this beach is. It is a well-protected bay, in contrast with the second most popular beach, La Brava. The latter means the opposite and its name reflects its windy and high tides. It is normally quite crowded during summer, even more during the afternoon, including vendors of various stuff such as dresses and beach attire. But it is worth visiting and taking a tour to appreciate the sunsets, the fine sand and the gentle breeze. 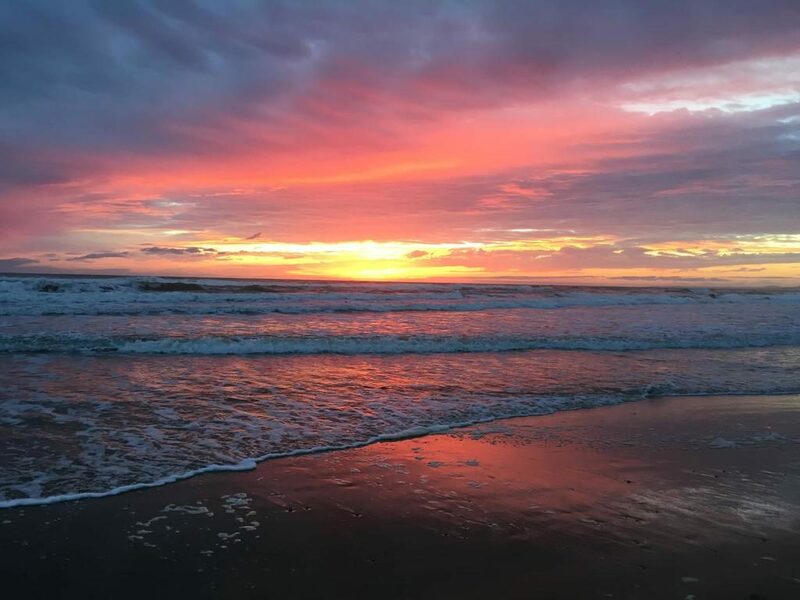 The sunsets on this beach are also famous. There are plenty of facilities such as parking areas, chair and umbrella rentals, WC, water sports (boats, jet skis, windsurfing and trampolines) and more. It is ideal for families and close to the city. La Brava the second most popular beach, and one of the closest to the peninsula. It can get super crowded during summer, especially mid-January, as you can see in the picture above. 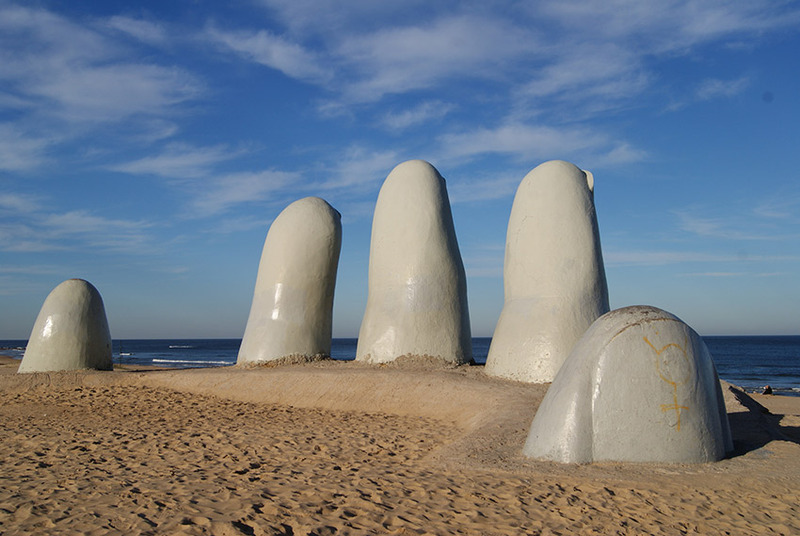 Its main landmark is the hand-shaped sculpture (called “La Mano” -The Hand-). Some of its most important beach clubs (“Paradores”) are Playa Brava, La Olla – the surfers favourite -, Papa Charlie and La Plage. Facilities such as umbrellas, sun-beds, WC, parking area and restaurants are available. The beach area is wide and includes boardwalks and pathways. As its name indicates, the water is rougher, and this is because of its location in the peninsula (eastern, facing the Atlantic ocean). So expect stronger winds and waves, although not all the time. The advantage of having these two shores so close is that you can always alternate and escape from the wind.